Ever had a problem you couldn’t solve on your own? By working with others, perhaps you accomplished more than you thought possible. Consider large communitywide challenges such as public education, workforce readiness and neighborhood redevelopment — can any one person alone fix problems in those areas? Even joining an effective, well-run organization sometimes isn’t enough to make a real difference. The necessity to work together has new meaning across Greater Cincinnati because of a shared effort called Collective Impact. It’s a disciplined approach that assembles numerous organizations around a common vision by adopting a set of measurable goals, working to reinforce one another’s efforts and getting everyone to row in the same direction. Collective Impact has been championed locally by the Greater Cincinnati Foundation (GCF) working closely with a group of independent organizations — defined as “backbones” — with unique insight into specific community issues. The collaborations nurtured by this process, with substantial funding over the past five years, have surpassed efforts from the individual organizations on their own. Assembling groups bridging many sectors — from nonprofits and businesses to government and philanthropic foundations — GCF’s Collective Impact movement has generated impressive results, a living, breathing and evolving practice that participants say is making our community stronger faster. Just how Collective Impact took hold here is a bit of a surprise. Cincinnati’s civil unrest in April 2001 spurred community leaders to study the root causes of rioting that shocked the Tristate. Cincinnati Community Action Now (shorthanded to the “CAN Commission”) formed teams to focus on issues such as education and youth development, economic inclusion, housing and neighborhood development. As the region’s most significant philanthropic funder, GCF supported the commission’s efforts and eventually assembled Better Together Cincinnati, a funders’ collaborative that supported new initiatives to address pressing problems in education, economic opportunity and police-community relations. Agenda 360 advances regional economic competitiveness by retaining talented workers and attracting new ones, by growing new jobs and retaining existing ones and by providing a good quality of life. It had been a program of the Cincinnati USA Regional Chamber but was recently integrated into the Chamber’s core work. Skyward (formerly Vision 2015) supports economic competitiveness in Northern Kentucky in close alignment with Agenda 360. LISC Greater Cincinnati and Northern Kentucky is our region’s program from the national Local Initiatives Support Corporation. It operates Place Matters, a place-based model for investing in underserved communities to strengthen neighborhoods and improve the quality of life for residents. Partners for a Competitive Workforce advances regional development efforts to meet employer demand by growing the skills of our current and future workforce. Incubated at GCF, this initiative is now housed at United Way of Greater Cincinnati. The Strive Partnership is a “cradle to career” initiative focused on improving outcomes for children and students in the region’s urban core. It was created by early childhood educators, school superintendents, college and university presidents, business and nonprofit leaders and community and corporate funders. Success by Six serves as a catalyst for change in early childhood education and kindergarten readiness. It’s housed at United Way. A seventh backbone was added in 2014, Green Umbrella, which works to maximize the region’s environmental sustainability in collaboration with Agenda 360 and Skyward. GCF’s five-year funding commitment to this Collective Impact mission has allowed the backbone group to coordinate efforts with each other and with hundreds of other local organizations, amplifying their ability to create positive change across Greater Cincinnati. A number of other funders have come on board to support them, led by United Way and Haile/U.S. Bank Foundation. 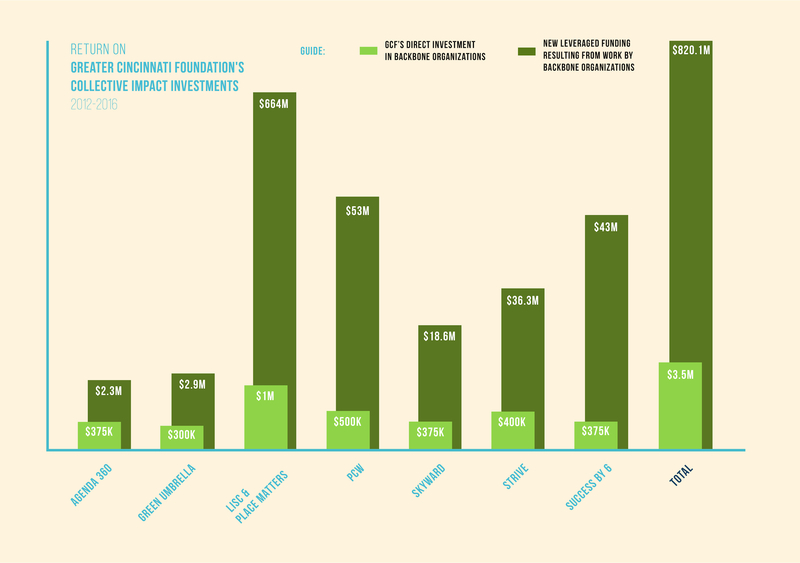 GCF’s $3.5 million investment in the Collective Impact program has resulted in more than $820 million in additional leveraged funding for the seven backbone organizations (see chart above). The better than 200-to-1 return on investment certainly underscores the power of collective effort and impact. John Kania, a national expert on Collective Impact who has advised GCF’s efforts, says Cincinnati’s program is unusual because of its collaborative focus. GCF has furthered this effort and impact with training in Collective Impact best practices and regular “community of practice” meetings that bring together representatives from the backbones and other key organizations involved in their endeavors — such as ArtsWave, The Women’s Fund of GCF, the Health Collaborative, Cradle Cincinnati and others — to compare notes, examine data, analyze results and brainstorm about mutually reinforcing activities and clear, consistent communications. 91 percent of Strive Partnership’s 40 indicators are trending positively. Partners for a Competitive Workplace has served 10,000 individuals across five career pathways with 89 percent completing the training, 78 percent becoming employed and 67 percent retaining employment a year later. LISC identifies positive results on 62 percent of its indicators related to education, health, income and housing in targeted neighborhoods. LISC and ArtsWave partnered to create arts-based activations in five urban neighborhoods. ArtsWave also applied for a National Endowment for the Arts grant to help educate Cincinnati arts organizations on the power of community and the benefits of bringing arts to those neighborhoods, and the NEA awarded the partnership $35,000 earlier this year. As another example of collaboration, Schwab says that Partners for a Competitive Workplace was struggling to get young learners into programs leading to factory jobs. Working with LISC, PCW hosted a series of focus groups in several neighborhoods. The best place to start is the Collective Impact area of the Greater Cincinnati Foundation’s website. See why big, complex problems require a collective approach with a shared vision and goals, and all hands on deck, rowing in the same direction. John Kania’s original article on Collective Impact in the Stanford Social Innovation Review is here. The first blog series co-authored by GCF and FSG in the Stanford Social Innovation Review is here. The second blog series co-authored by GCF and FSG is here. The Collective Impact Forum’s website is here. Once upon a time modest Cincinnatians cited an apocryphal remark supposedly by Mark Twain: “When the world ends, I’d like to be in Cincinnati because everything happens there 10 years later.” That’s certainly no longer true. In fact, when it comes to initiatives in the social service sector, it’s just flat-out wrong. Today Cincinnati is probably 10 years ahead of the curve, serving as a model that numerous cities and regions look to as they grapple with complex social issues. Over the next several months Soapbox will publish a series of reports exploring how Collective Impact is changing and improving Greater Cincinnati. Look for them in the third weeks of July, August, September and October. Support for this "Collective Impact" series is provided by Greater Cincinnati Foundation. Infographic by Steph Landry Design. John Kania is managing director at FSG, formerly Foundation Strategy Group, a mission-driven strategy and evaluation firm that principally serves organizations such as the Greater Cincinnati Foundation. He co-authored a series of articles in the Stanford Social Innovation Review five years ago that crystallized the concept of Collective Impact. Soapbox: Where did the idea of Collective Impact originate? John Kania: FSG moved from just doing strategy with foundations to evaluation working cross-sector with many different types of organizations: foundations, nonprofits, government and business. Our skill set worked with any of them. It dawned on us that there was a real opportunity to move from what we called “isolated impact” to “collective impact.” We stepped back and did some research to see if there were efforts out there that were making positive and consistent impacts at scale by working in a collective and collaborative way. Was this a brand-new approach? JK: Actually similar types of collaborative activity — often called “comprehensive community change” — had been around for decades, but that wasn’t a very catchy phrase. We coined the term “collective impact” in an article that Mark Kramer and I published in 2011 and framed the key conditions for success. The article kind of went viral. It sort of made people sit up straight. The phrase sounds interesting, and it has intention: It’s collective action and significant impact. We wanted to get down to a simple set of rules — not too little, not too much — that could be used for working through large-scale complex problems such as challenges facing public education. How do you define a Collective Impact initiative? JK: It’s a long-term commitment by a group of important actors from different sectors to a common agenda for solving a specific social problem. Their actions are supported by a shared measurement system, mutually reinforcing activities and ongoing communication and are supported by an independent “backbone” organization that facilitates the partnership. And you found a great example of a “backbone” organization in Cincinnati? Cincinnati is seen as a model for Collective Impact. How did that happen here? JK: Cincinnati had all the conditions required for readiness. There was a sense of urgency following the civil unrest there in April 2001. A set of community leaders championed the initiative, and a serious level of visionary support came from organizations with political and financial capital, in particular the Greater Cincinnati Foundation, the United Way of Greater Cincinnati and the University of Cincinnati. Any thoughts on why it’s worked so well in Cincinnati? JK: Midsized cities seem to be fertile ground for Collective Impact efforts. They have more people with expertise and talent, human capital and funding than can be found in rural areas. In bigger urban cities — New York or Los Angeles — it’s hard to bring the right people together. What makes Collective Impact work is connectivity, relationships and trust-building. Those conditions have been and continue to be present in Cincinnati.